Drug discovery excellence is a critical prerequisite for success in drug development and remains a highly neglected area for the African continent. The lack of market incentives has biased drug discovery efforts globally away from diseases most prevalent in the developing world. Collaborative efforts of multidisciplinary teams – in drug discovery and other fields – shows that success and efficiency increases significantly when individual contributors combine their complementary capabilities. The whole is greater than the sum of its parts. State-of-the-art approaches to implementing drug discovery projects, especially when the goal is to also build drug discovery capability on the African continent, need to be supported. The founder and director of Africa’s first integrated drug discovery centre, Professor Kelly Chibale, has been named as one of Fortune magazine’s World’s Greatest Leaders for 2018. In much of Africa, the infrastructure to support scientific research is sorely lacking. But Chibale is working to change that. 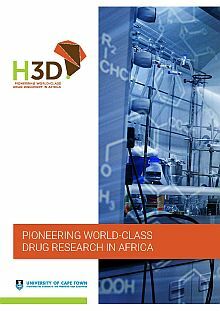 The Zambian chemist has built H3D, Africa’s first integrated drug discovery center, at the University of Cape Town. His team now includes more than 90 researchers; they work out of state-of-the-art facilities thanks to partnerships with the Gates Foundation, Novartis, and South Africa’s government. H3D already has a potential drug for ­malaria in human trials.